Microsoft chief executive Steve Ballmer formally withdrew the offer in a letter to Yahoo chief executive Jerry Yang. The software giant had wanted to do a deal to be able to compete with Google, which dominates the lucrative market for internet advertising. This market was worth $40bn in 2007 and is predicted to double to $80bn by 2010. In his letter to Mr Yang, which has been posted on the Microsoft website, Mr Ballmer said: "We continue to believe that our proposed acquisition made sense for Microsoft, Yahoo and the market as a whole. "Despite our best efforts, including raising our bid by roughly $5bn, Yahoo has not moved toward accepting our offer. "After careful consideration, we believe the economics demanded by Yahoo do not make sense for us, and it is in the best interests of Microsoft stockholders, employees and other stakeholders to withdraw our proposal." Mr Ballmer also told Yahoo's boss that he would not pursue his original plan B of launching a hostile takeover battle, because Mr Yang would "take steps that would make Yahoo undesirable as an acquisition for Microsoft". Mr Ballmer told his own employees that Microsoft could achieve its goals without Yahoo, albeit at a slower pace. 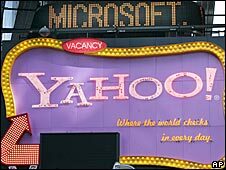 Yahoo maintained that Microsoft had offered too little to buy the company. In a statement issued after Microsoft's withdrawal, Yahoo chairman Roy Bostock dismissed the unsolicited bid as a "distraction". Microsoft's shares closed on Friday virtually unchanged at $29.24. Yahoo's shares were $1.85 higher at $28.67 amid expectations of a higher Microsoft offer. The BBC's Peter Bowes says analysts believe the breakdown in talks may have an adverse affect on Yahoo shares and generate uncertainty among investors about the company's management. Sir Martin Sorrell, the chief executive of advertising group WPP, said his clients would be disappointed that Microsoft had abandoned its bid for Yahoo. "A combination of Microsoft and Yahoo would have provided balance to the online advertising market place," he told the BBC News website. However, he said that Microsoft was a "resourceful and innovative company" and might still be able to provide a challenge to Google's market dominance. Who loses most in Microsoft's failed Yahoo bid?